"Major renovation was undertaken of the Seminary Chapel. As early as March 1906, Prof. Ferdinand Baraldi and a staff of eight were redecorating the interior. Exteriorly, the original belfry in the center of the facade was removed during the course of the summer and a new entrance cut beneath it, the old side entrance to the west was transformed into the Chapel of the Sacred Heart, an archway was constructed, linking the Chapel to the Seminary." Henry G. J. Beck, The Centennial History of the Immaculate Conception Seminary Darlington, N.J. September 1962, 33-34. 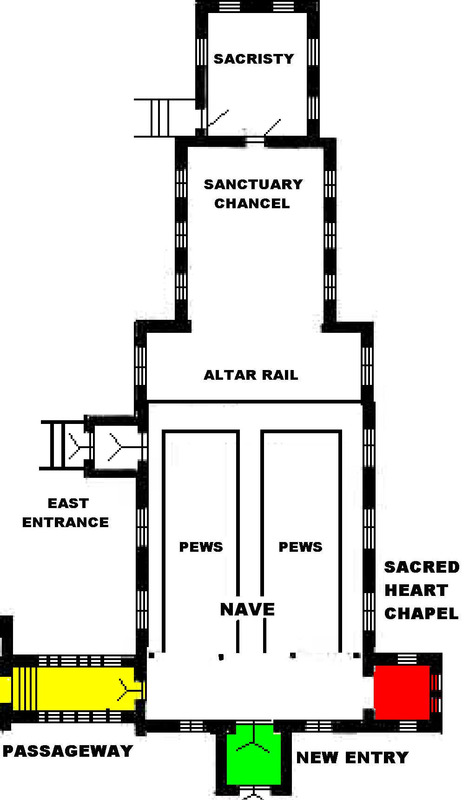 The 1906 renovations closed the old entrance (red), which became the Sacred Heart Chapel, added a new entrance (green), and the passageway (yellow) to the Seminary Building (Presidents Hall). The Chapel has now assumed its familiar appearance. There would be no further major renovations. The windows remain glazed with diamond-shaped leaded glass, the new and lighter-toned brownstone of the new entry and passageway stand out clearly. 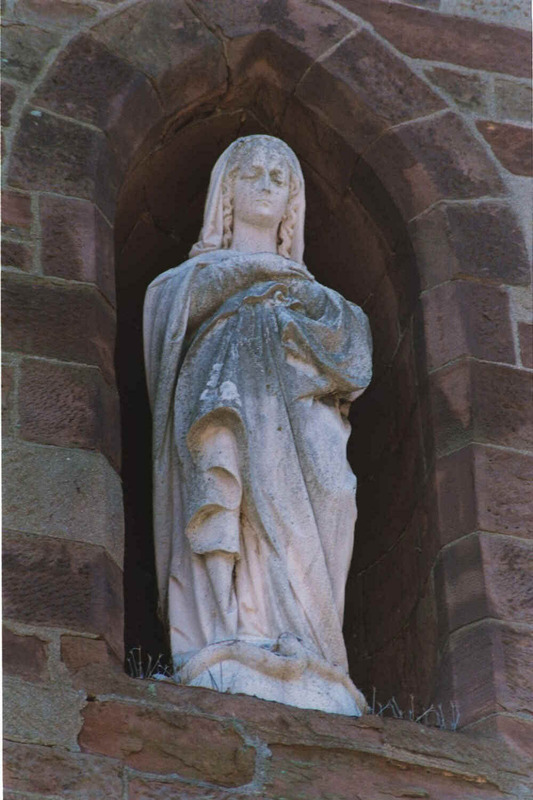 Additionally, a statue has finally appeared in the niche above the central window. Where did it come from? The empty pedestal in front of and to the right give us a clue. We will find part of the answer in other century-old postcards. The picture of the Chapel in the colorized postcard above is taken from the same photograph as the black and white one above. 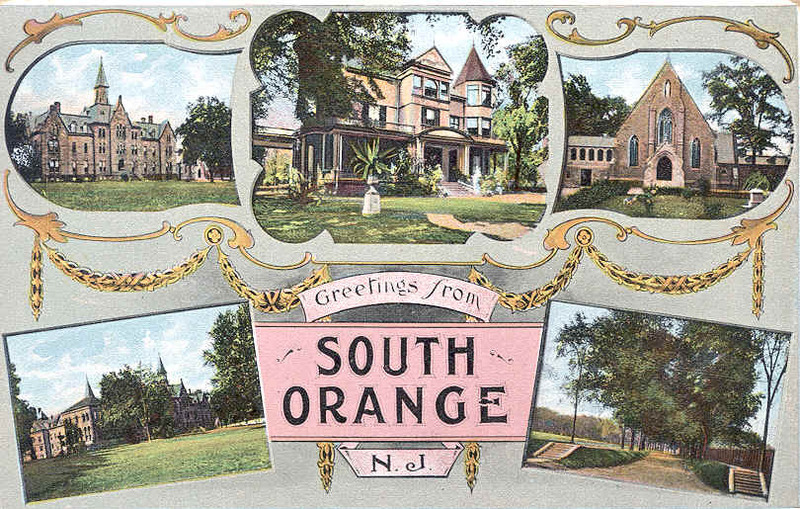 It contains the only known photograph (upper center) of the "Bishop's House," the residence of the Bishops of Newark on the Seton Hall campus until 1957. Today the only remnant of the Bishop's House is the "Carriage House," now called the "Art Center," which houses the Department of Art and Music. 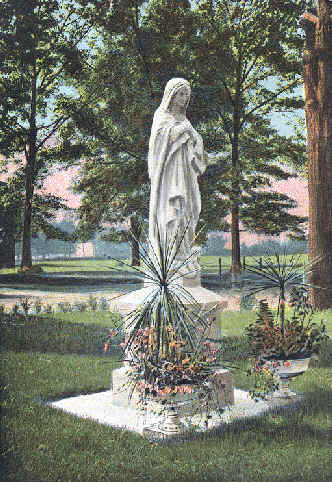 This postcard, of approximately the same vintage (c.1906), shows a statue of the Blessed Virgin on a familiar pedestal. 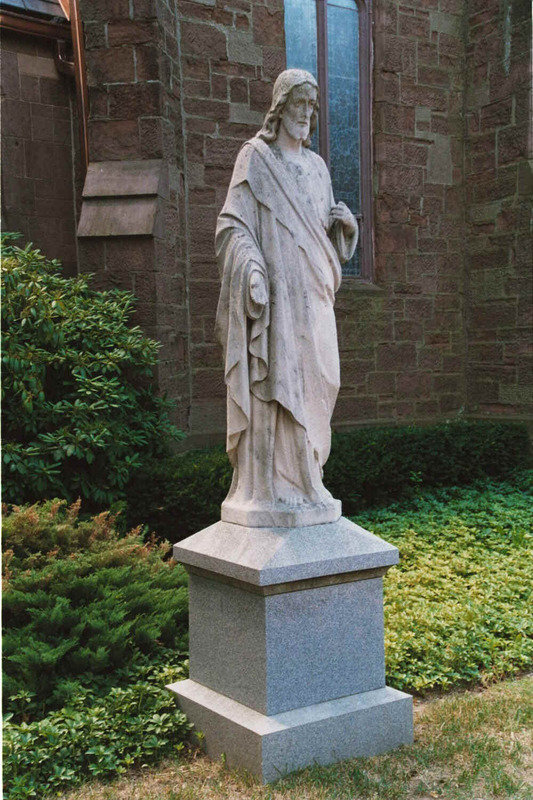 Apparently the statue of the Blessed Virgin was on the pedestal in front of the Chapel for a while before the 1906 renovations. It was then moved to the niche. Are we sure it is the same statue? A photograph of the statue today confirms this supposition. 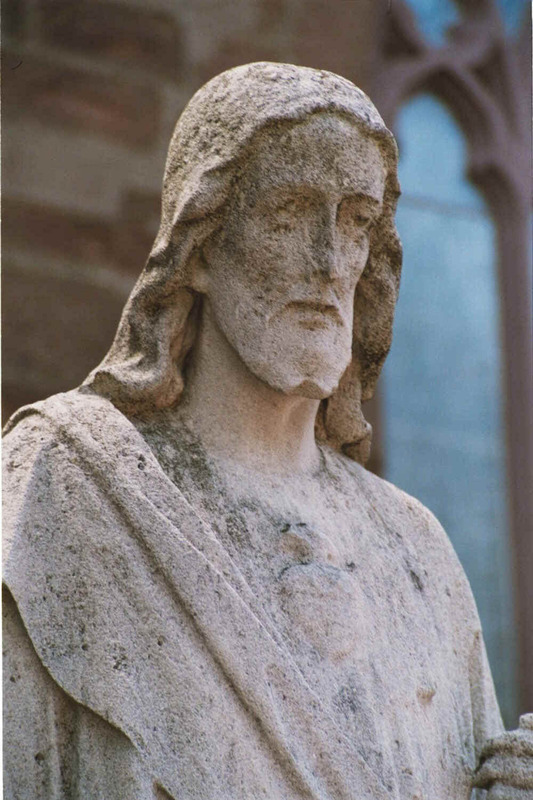 The statue of the Sacred Heart, purchased in 1907 for $230, replaced the statue of the Blessed Virgin on the same granite pedestal in front of the Chapel. Severely weather damaged, it was moved to its present site to the left of the Chapel entrance when the plaza was redesigned in the 1990s.